Our sizzling summer has begun and 100º plus temperatures can really take the wind out of my cooking sails to say nothing of still one-handed cooking. For starters I pulled out a pound of shrimp and after it thawed out peeling it became the issue, but I can still prep the “cocktail sauce” albeit more time-consuming that usual. Still and all it was a happy thought and idea for a summer day, but sitting under the umbrella, poolside before the sun goes down is not exactly the best idea at the moment…perhaps a game of sequence inside while snacking our way through the dinner hour would work. The recipe is loosely based on a Rick Bayless’ recipe adaptation and the first time that I made it I winced at the word ketchup, but it works and I’m sure Michael will fall into it at the mere mention of ketchup so the most cooking time involved is bringing the shrimp bath to a boil and a quick dip into the (1 minute or so) bath, drain and the shrimp will finish cooking on their own as they rest. 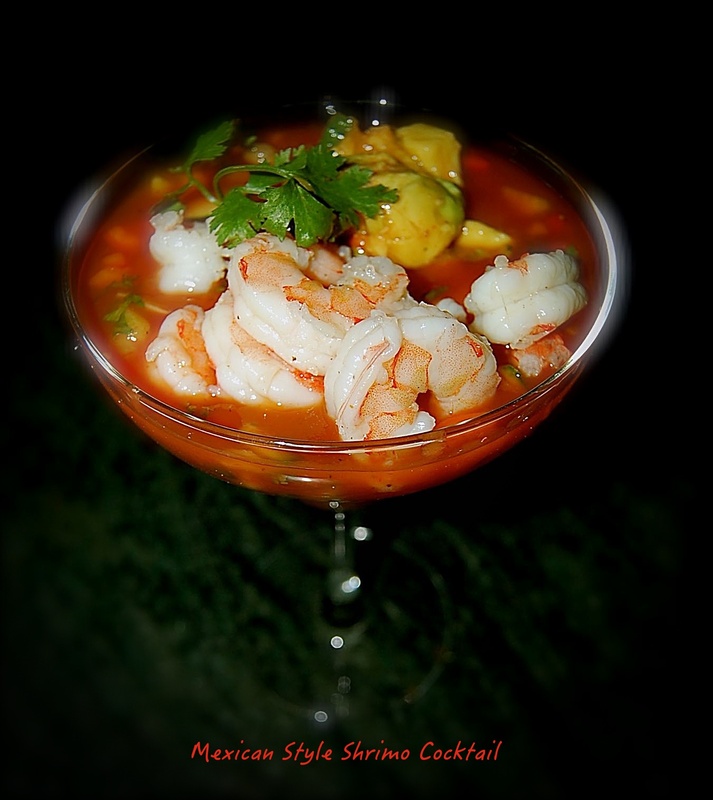 Bayless suggests making “the dressing” and vegetables in a two-step preparation, but just treat it as gazpacho and mix it all together, spoon it into serving glasses or bowls, top with shrimp and garnish with lime wedges and cilantro. To a large saucepan add, diced onion. 1 tablespoon kosher salt, 3/4 tablespoon black pepper, 1 lime quartered, 1/2 Meyer lemon, and two cloves of smashed garlic. Fill with water and bring to a boil add 1 pound peeled and deveined large shrimp, turn off heat, allow to sit for 1 minute drain and cool. Mix the following ingredients chill, serve in individual bowls or margarita glasses, also great for mini appetizer portions. Favorite garnishes: Tajin seasoning, fresh cilantro, avocado or guacamole, minced jalapeño peppers and lime wedges. Winner winner one good shrimp “cocktail” dinner and enough left for lunch with a few UTZ crab seasoned chips. Posted on June 17, 2015 by ibbeachnanaPosted in Appetizers, Cocktails and Appetizers, Mexican, seafood, ShrimpTagged shrimp cocktail.